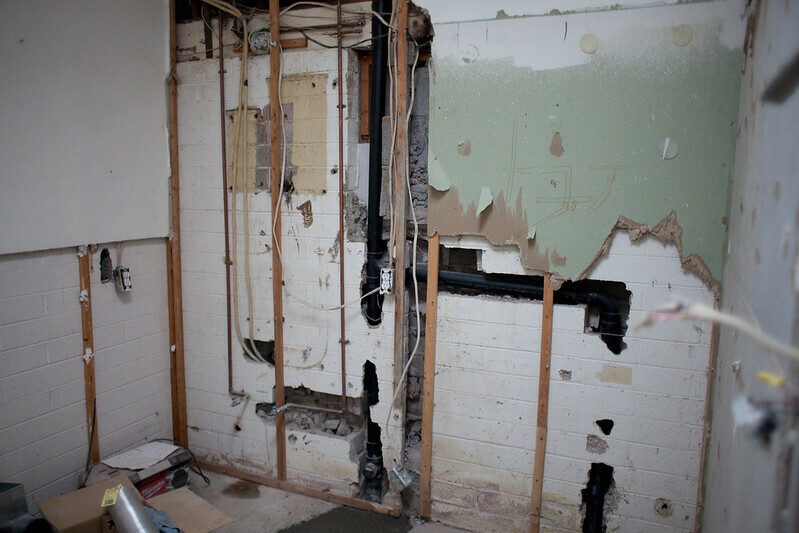 Unfortunately, that first (blurry, iphone) photo on the left is the only “before” photo I have of this bathroom, taken a week or two after we bought the house. Chalk it up to the fact that a dude was still living there when we bought the house, and then plain forgetfulness when we actually started the project. In any case, not pictured: stench of cat urine, dead cockroaches, stub-ups for non-existent plumbing fixtures, hole in the wall behind the toilet, untold grime, and so on. This photo was before Crazy Dan moved out, so that’s his random stuff. After he left, and we filled a dumpster with his dirty crap (including, inexplicably, a pair of black ladies underwear, size XL), I tried to clean the bathroom. I really did. We weren’t really going to use it, it was that bad, but if it was going to be part of our home I kind of at least wanted it to be sanitized. Among other things, I literally poured a layer of bleach on the floor and let it sit for an hour, then scrubbed. Did it help block out the cat pee smell? Did it take any of the ground-in filth or copper staining out of the floor? None of the above. So we closed the door, moved a large piece of furniture in front of it, and pretended it didn’t exist. Six months later, with our coffers somewhat rebuilt, we decided to tackle the bathroom (I may or may not have said something like, “before the baby comes, that bathroom better be done”). 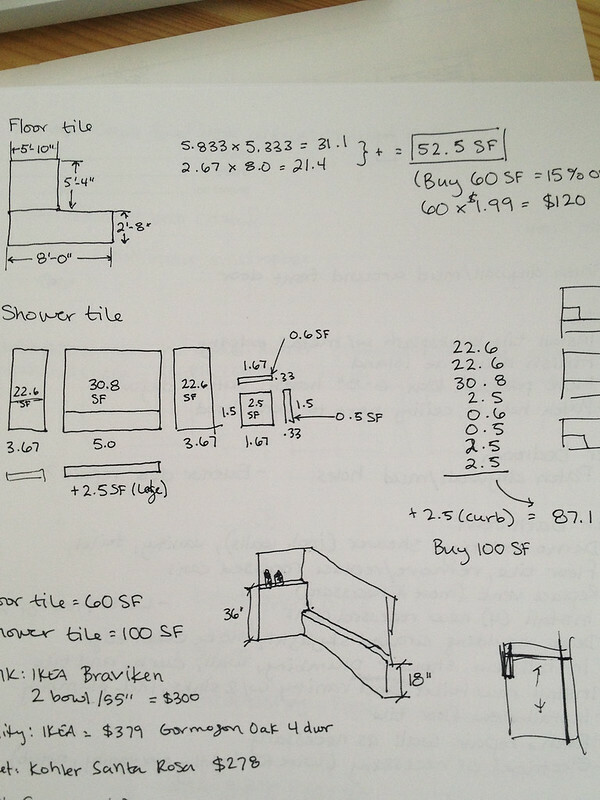 Actually, in a new move for us, we decided to pay someone ELSE to tackle the bathroom. This was dictated somewhat by the fact that at four months pregnant, I couldn’t help as much as I normally would, and partly by the fact that a lot of what we were doing was beyond our scope of knowledge. If you look at the “before” layout, above, compared to the “after,” below, you can see that we moved every single fixture. 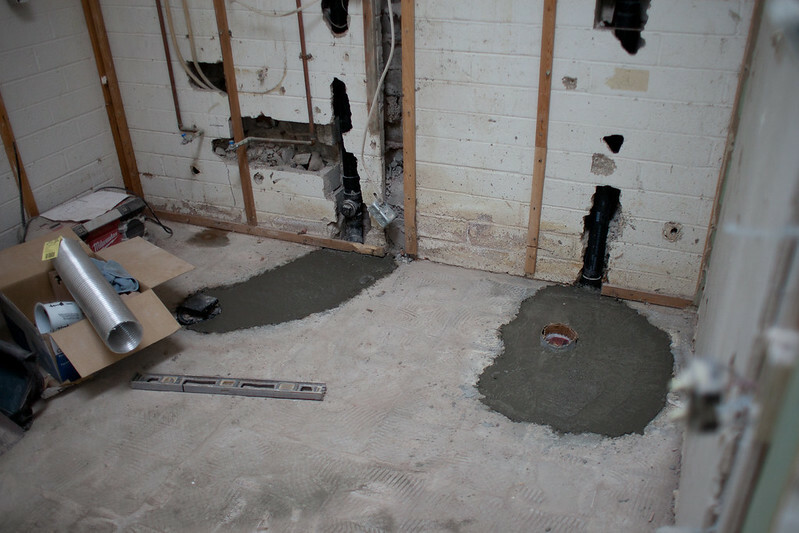 Which means the concrete floor had to be jackhammered up and sewer pipes moved. Now, I’m happy to DIY plenty of things, but I feel ok leaving sewer pipes to the professionals. 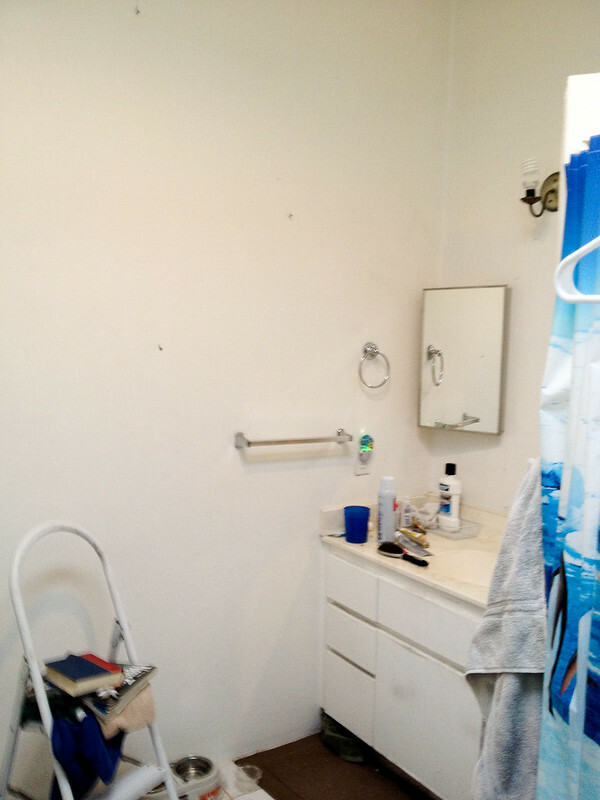 So this is the best I can do for “before” pictures, which are really post-demo. 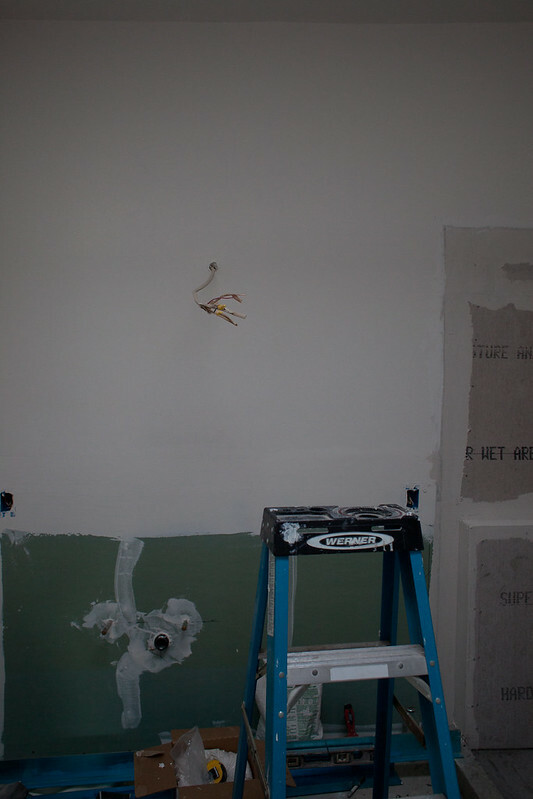 There was a lot of complexity to this project since it meant not only the aforementioned jackhammering, sewer pipes etc, but moving plumbing supply lines and electrical (including lighting and venting), greenboarding the whole room below 48″, building a wall and a concrete shower curb, tiling, mudding, finishing, and the list goes on. Having our wonderful handyman Ricardo do all this for us was worth it for us in this case, because it allowed the project to go much more quickly and just be done better. 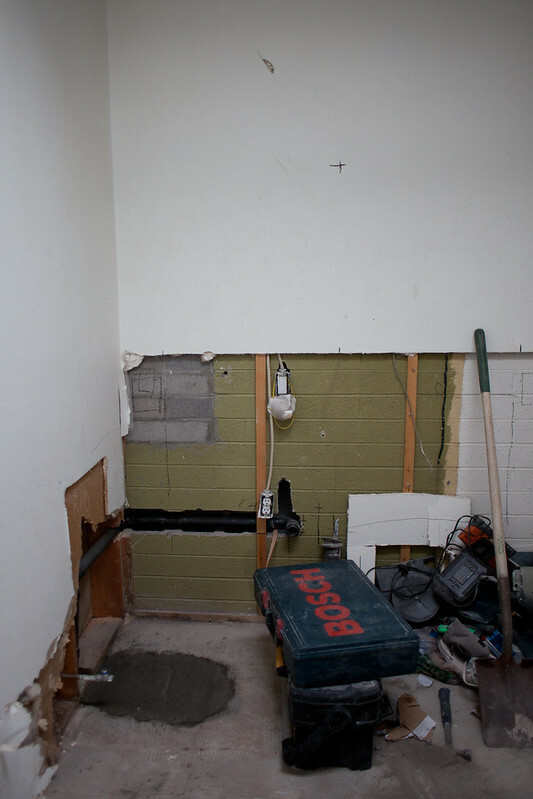 In these pictures you can see the filled holes in the concrete floor where sewer lines were successfully moved, as well as the start of opening up the walls to move everything else. 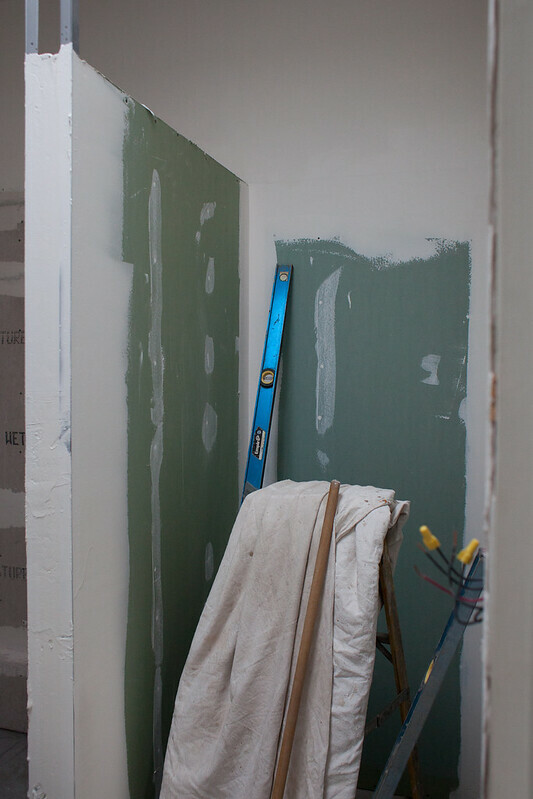 Since some of the walls of this bathroom were originally exterior block, you can actually see old house paint colors too! 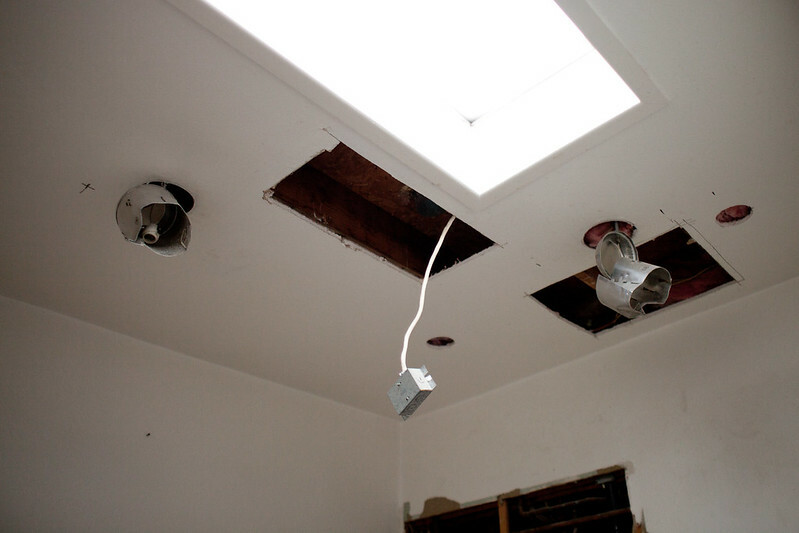 Next up, the ceiling with the old vent and can lights, most of which didn’t work. Look at the skylight though, that’s a nice feature! The bones of this room are pretty decent, it’s got 9′ ceilings, a large skylight, and it’s big, like 9′ x 10′. A good size for master-y feeling master bathroom, once we’re done with it. Aside from the grime, the previous layout was just bad. It made the space feel smaller and more cramped than it really was, by being sort of L-shaped. 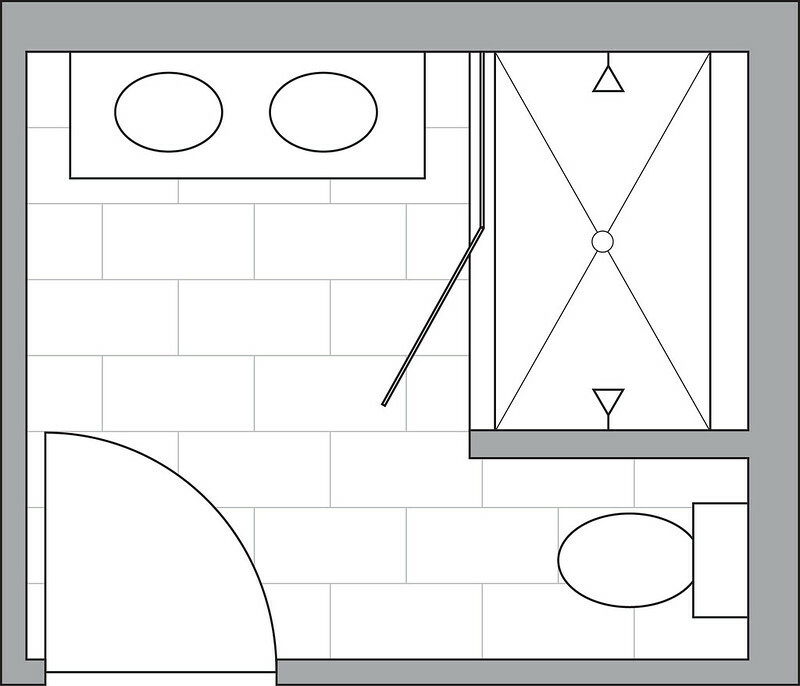 It was likely intended for a wheelchair-bound person, since it had a roll-in corner shower and a grab bar, but the layout meant that the part of the bathroom on display as you walked in was the toilet, and the vanity, which is used more often, was tucked into a corner. Changing the layout completely, though it added project time and complexity (and therefore cost), really makes this bathroom open up beautifully. 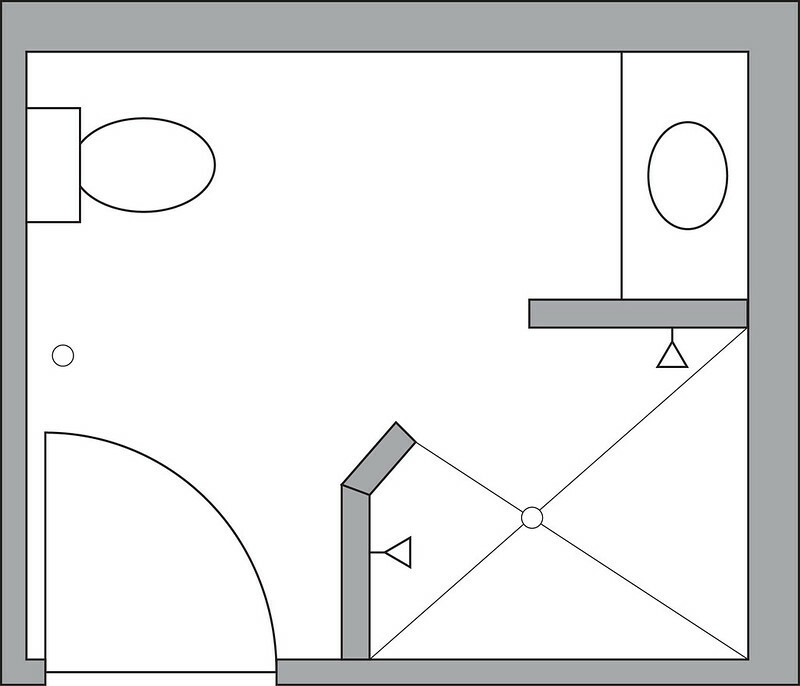 With the circulation space concentrated in one area, the bathroom feels huge, and the feature is now the vanity and shower, with the toilet tucked off in its own space. Since we plan to be in this house for a while, it was worth it to us to take the extra time and money and make it more functional for us. 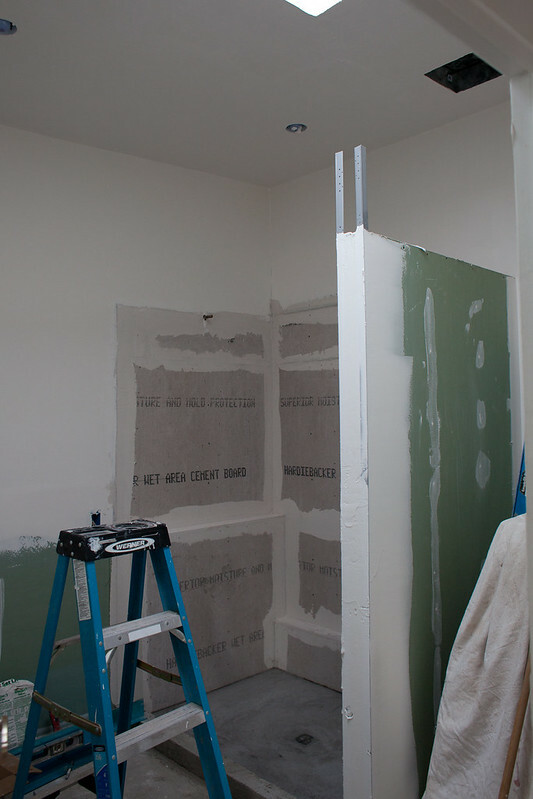 In the next few pictures below, you can see the bathroom starting to take shape! No more open walls with pipes and wires everywhere. I always love this phase of a project when it starts to look less like a disaster and more like a clean slate. Even better when I just peek in and it’s like elves have been there, doing the work (really noisy elves – since I work at home, there was more than one conference call where I kept having to say “sorry, what? They’re jackhammering in the other room”). 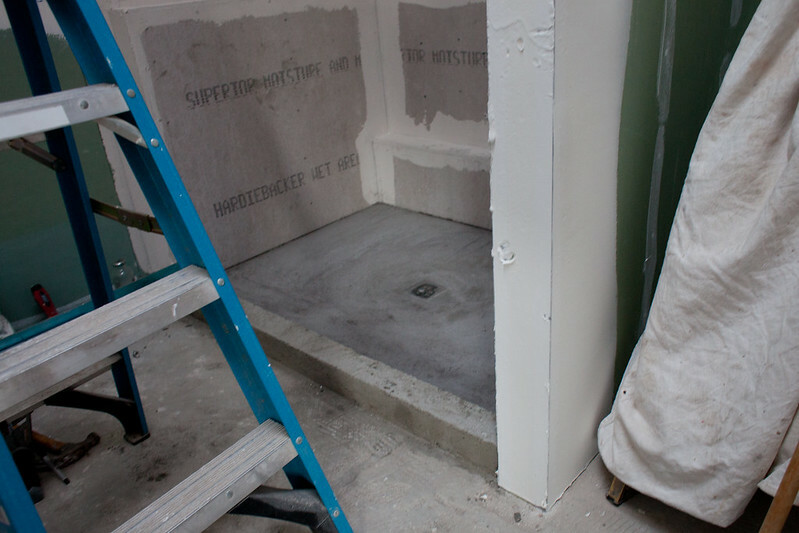 On the left is the shower area, and on the right is the toilet space. Ooh look, a shower floor and curb! Woot! 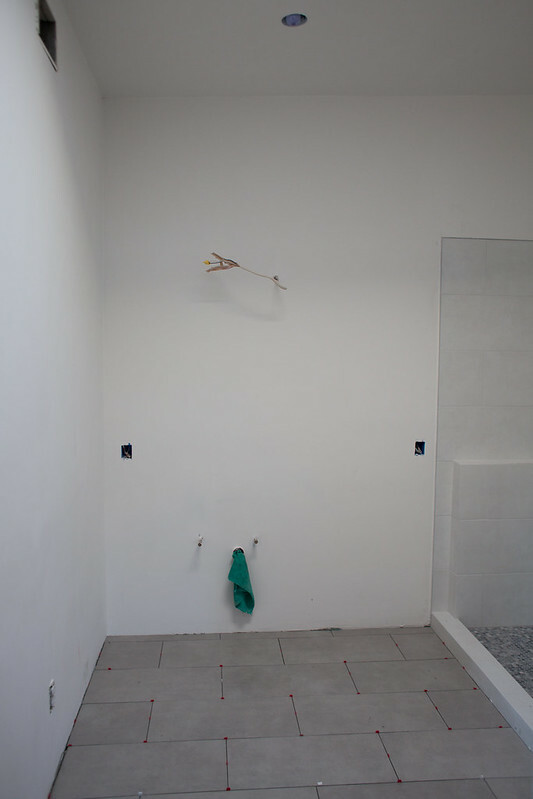 Next, pictures of the vanity area, and the tile floor is starting to go down. 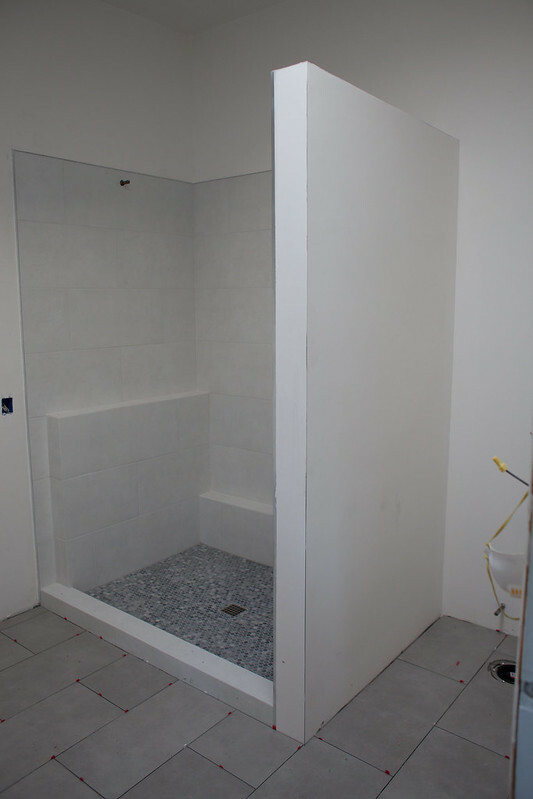 We kept it simple with tile and used the same floor tile as the other bathroom, a basic gray porcelain, with a white tile from the same line for most of the shower. The floor is a variegated gray penny tile, for grippy texture and overall hotness. Love! Lastly, the tile is done! The shower is built! The fixtures hadn’t been installed yet when this picture was taken, but there are actually two shower heads. It’s like being in a spa or a fancy hotel! And maybe you’re wondering, hey what are those ledges in there? 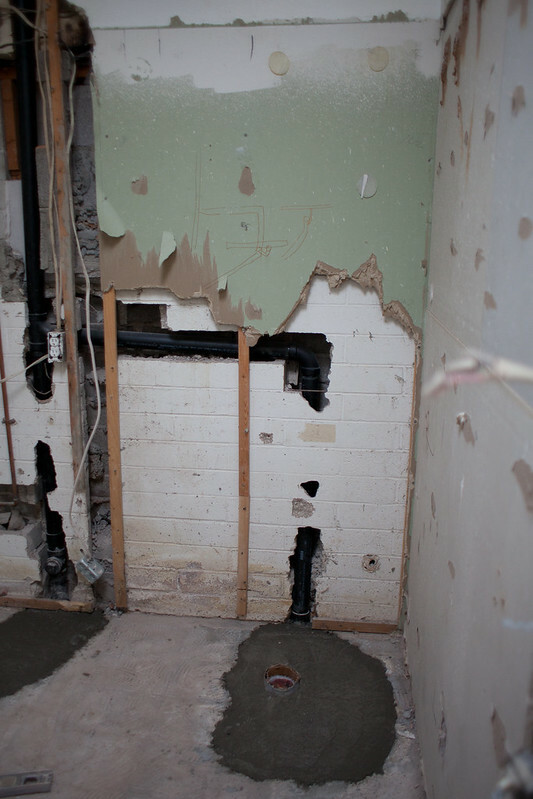 Since both the back and side wall of the shower were concrete block, making a soap niche like we have in the other bathroom was difficult if not impossible. 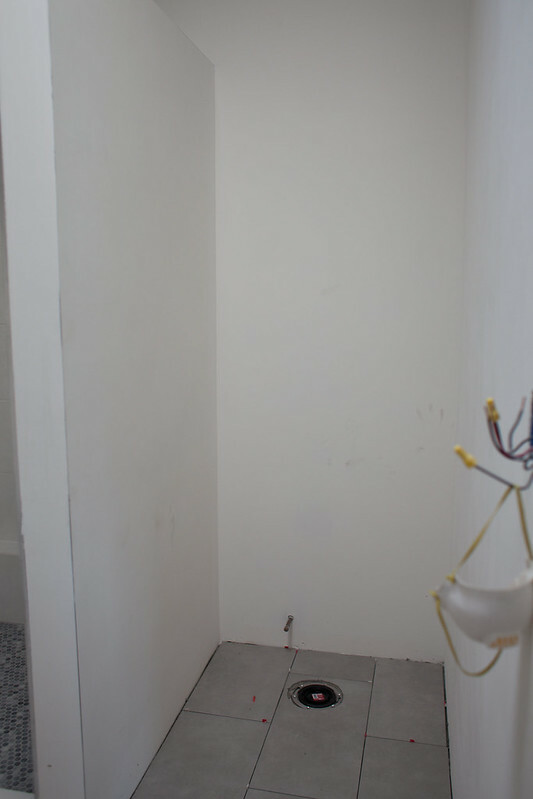 Since we have the room, we added a short ledge along the length of the shower, for putting your foot up on to shave your legs, and a shorter, taller ledge for shampoos and other shower stuff. The nice thing is that both are below waist height, so you don’t feel like they intrude into the space at all. Hopefully soon I’ll be able to show you pictures of the finished product. We have a couple last IKEA and Home Depot runs to make, but as soon as there’s a light in there, I’ll do a full reveal. In the meantime, I’ll show a couple other (smaller) projects we’ve been working on.